You have come to the part of your wedding search that will hit your pocketbook the most. The reception will cost you more than any other part of your wedding. We realize that you want your guests to have a very pleasurable dining experience so you will want to make sure that you do your due diligence in order find the caterer that can provide that kind of service. A Google search for wedding caterers in the Atlanta area will result in hundreds of websites related to this service. Your question is how do you pare that list down to the one that you will be completely satisfied with. Your main way will be to interview potential wedding caterers and asking them the questions that we provide you below. Pick out some of the caterers from that Google list that are closest to your reception location to start with. After checking each website and reading the reviews on each one, make an appointment with each one that seems to have potential and the ones that have your wedding date available on their calendar. Obviously, the main topic of conversation will be about food. Ask them if they specialize in any particular type of food. Can they show you some sample menus? We recommend that you setup a food tasting session with the ones that you are really interested in. If you want to make sure of anything, makes sure that the food tastes absolutely fabulous. Make sure that you understand what each caterer will provide in terms of service. Obviously, you know they will prepare and serve food and drink. But what about items like tables, chairs, plates, table linens, silverware, salt-and-pepper shakers, place settings, etc. Do they provide these items or do you have to rent them from somewhere? Ask them if they will be working other weddings on your wedding day. If they say yes, we suggest that you try and avoid this is at all possible. You want their undivided attention and you don't want their staff to be split or shared between you and another wedding. And speaking of staff, ask how many servers they recommend for the size of your wedding. What do they wear? A lot of people don't think to ask this, but find out where the food will be prepared. Are there facilities on-site? If so, make sure the venue and the caterer will coordinate well together. If the caterer has to bring in their own equipment, will that cost you more? Do they only work with fresh ingredients or are there some that are frozen? How will the food be arranged on the table? Ask to see photos of previous wedding arrangements. Don't forget to talk about alcohol. Will the caterer provide this or do you have to? If you have to, is there a corkage fee? Last but not least, ask for references that had a similar menu to yours. How much is all of this going to cost you? Make sure they provide you with a bottom line number. 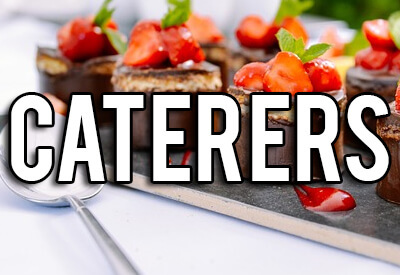 AT this point, you should be gravitating to one of the caterers you have met with and if their price is right, it is time to sign a contract, put down a deposit, and exhale a breath of satisfaction that you have a professional caterer that you make your wedding reception the best that it can possibly be.